EPICA is a major player in the female fronted, Symphonic Metal world. Hailing from The Netherlands, they have released five studio albums to date. “The Quantum Enigma” will be their sixth. The “Beauty and the Beast” vocal trade-offs between Simone and Mark characterize their sound, combined with lyrical content on philosophical topics like science, religion and world events. “The Quantum Enigma” contains thirteen tracks. “The Second Stone” wastes no time asserting itself in a crowded room of resonance. Simone’s vocals are beautifully frail and robust at the same time, and she can turn this on or off at will. Mark’s contrasting vocals give a gritty edge to the bridge section and the background chants provide a haunting air of chill to the track. “The Essence of Silence” features Mark in the versus, and a pleasing rhythmic section that is chocked full of chops and background melodies that are both rough and soaring at the same time. The music walks the fence so very well, leaning and darting each direction with the precision of a surgeon. In “Sense Without Sanity”, we are privy to an exquisite symphonic opening, and edgy moments of pure power metal bliss and potency. The upper ranges of Simone’s voice fill the air with a warm breeze. “Unchain Utopia” is a perfect example or the sweeping dimension of creativity the band brings to their songwriting, which is often shared by all members. The full on crescendo runs the hairs up on the back of your neck as quickly as the piano and sitar interlude catch the inner beauty of the track. One need look no further than the interlude “The Fifth Guardian” to hear some absolutely marvelous splendor, that for me conjures up images me of the Scottish Highlands with soaring, snow-capped mountains, deep, dark bodies of water, and fields of green that lay as far as the eye can see. “Chemical Insomnia” connects the second half of the album. Powerful, hard and punchy is the rhythm section of the song, displaying the dark and brutal side of the band. Though the chorus brings it back down to melody before unleashing it again, the heavier side wins out here, much to my liking. This might be my favorite track on the album. “Omen” showcases the more tender side of their songwriting, with a sustained chorus in full splendor. Mark’s vocals fry augment the more sovereign side of the track, while “Canvas of Life” is even more frail, a deeply moving emotional piece, where “Natural Corruption” flirts with some folky sort of Power Metal elements that I enjoy. The chorus easily sticks in my head, and the instrumental passage after the second chorus attacks your senses. 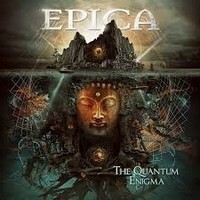 Closing the album is the title track, “The Quantum Enigma”. It builds slowly, into a monumental display of composition. Overall, an absolute epic journey of musical transcendence. EPICA has always produced a product that is full-throttle in terms of instrumentation and grandiosity, but this album tops all previous efforts. The cadre of different sounds and themes that they can work into their music, but still keep the song discernable, is nothing short of stunning. I don’t think I have heard an album of this genre in a while that is as far reaching in depth and breadth, like the canopy of stars on a clear winter night. In an album of thirteen tracks, there is not one that doesn’t resonate with me, not one moment wasted. This album is poised to keep them firmly rooted at the top of the Symphonic Metal mountain.